Collection>The danish golden age>P. S. Krøyer>Krøyer P. S.
Pastel on paper, 57 x 68 cm. The close connection shared between husband and wife is the central theme in P.S. 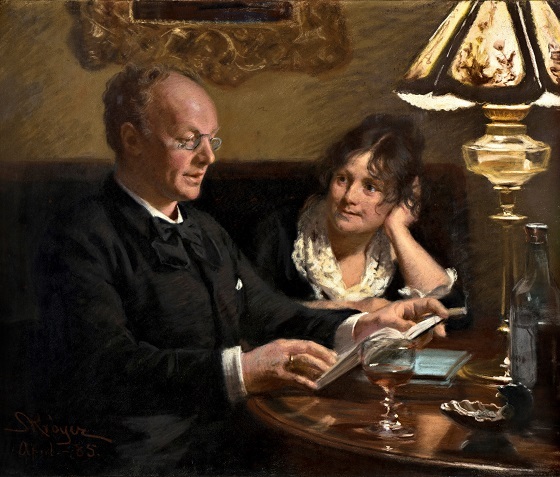 Krøyer’s informal double portrait of the Danish actor Emil Poulsen and his wife Anna. Resting her cheek on her left hand, Anna directs a loving and admiring look at her husband, who is concentrating on reciting a passage from a book. The dim lighting of the table lamp and the positioning of the fortified wine at the front of the table subtly underscores the cosy and intimate evening atmosphere that has permeated the living room. Emil Poulsen was acknowledged among his contemporaries as a successful stage director and character actor at the Royal Danish Theatre. He was furthermore also part of the Hage family’s social circle, which may explain how this painting came into the possession of Johannes Hage’s sister, Vilhelmine Heise, after Poulsen’s Death.